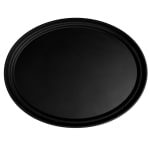 The Cambro 2700CT110 Camtread® serving tray uses a thick rubber surface to prevent slipping and hold food and drinks in place. Since this surface is molded into the material, it resists wearing off. For lasting use in commercial applications, it is made of heavy-duty fiberglass. Stacking lugs are built into the Cambro 2700CT110 Camtread serving tray, making it easy to stack without jamming and enabling it to dry quickly. It comes in black, so the tray can be used in virtually any setting. "This tray is excellent quality. The non-slip surface is perfect. I would absolutely buy it again!"